We are lucky to be alive during the 21st Century. A huge number of diseases have been eradicated and, once life-threatening illnesses can now be cured within days. However, this euphoric achievement would not have been possible without the measures of a few brave members of the society who spread the awareness of such diseases. Today, only a few life-threatening illnesses prevail, and it is upon us to eradicate them from this planet or find effective cures at the least. LeadsRain here takes a moment to acknowledge the efforts of mankind in this gargantuan achievement and urge you to spread awareness about the horrors of diabetes and their prevention. It is in the honor of Sir Frederick Banting, the brains behind the discovery of insulin, that we hold this awareness campaign today. But is naming a day after this disease, all it takes? There are a number of facts that do not reach the concerned audience at the right time, and we don’t have anybody to blame for that. Healthcare and pharmaceutical industries need to rise to this occasion and ensure that their listeners are rightly, and thoroughly informed. Certainly, it is not easy to run a marketing campaign on a large scale, when your audience consists of worked-up corporate individuals who don’t even find time to enjoy their meals during the day (that’s right, I did my research). So what are you aiming at? 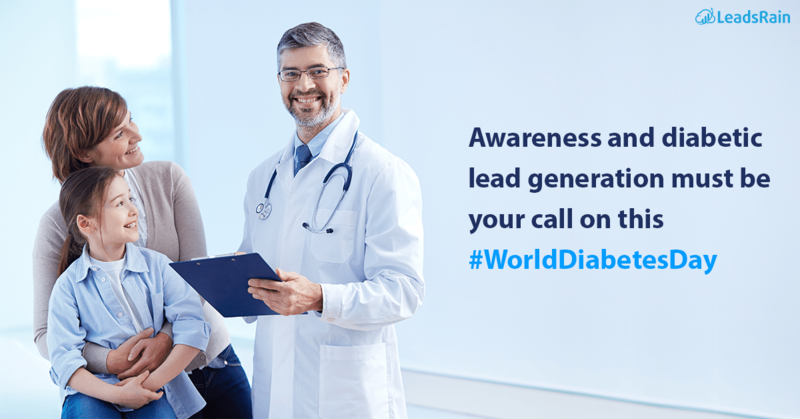 A heartwarming awareness campaign, or a diabetic lead generation to help those who are affected? What is the quickest way to reach the listeners? Their cell phones of course. On this day, a voicemail drop will be your biggest ally when it comes to reaching your listeners. The ringless voicemail drops are the right choice here because of a number of reasons, but the most pivotal of them all is the fact that, because this is not only an awareness campaign but also a diabetic lead generation campaign that we are talking about, the mode of communication must comply to the laws. Ringless voicemail not only confines itself to the laws but also comes with the added benefits as mentioned below that makes it more recipient-friendly tool. A ringless voicemail will deliver your verbally recorded message into the recipient’s voicemail box without ringing the phone. The recipients will be able to listen to your message as and when they find the time. This offers comfort to your listeners since it does not disturb them at unwanted times. Another important benefit of the ringless voicemail is that it delivers a verbal message that can be made actionable. This gives clarity in terms of delivering an important message and if you are hosting a free check-up, they can call you back on the same number if they are interested. When emphasizing specifically on an awareness campaign and you have double opt-in data, you may also use our rich text message services. If you wish to send a verbally recorded message, the voice broadcasting services is also an option. Give a deeper meaning to this important day of the year, with a simple voicemail drops campaign in your city or even neighborhood. Make them voicemail drops, for a cause. An awareness campaign need not be for those who have the data of diabetic patients or those prone to diabetes. Take the assistance from this result-oriented technology and make the difference that this world deserves. For those healthcare centers looking to run a diabetic lead generation, your solution is only a moment away from here. Reach your massive audience. Let us take a step to eradicate this woeful disease together. How Voice Broadcasting Service can be Used for Political Campaign?